Bob Lujano is an international public speaker who covers the topics of independence, disability, competitive sports, physical fitness, and the benefits of a healthy active lifestyle. He is a member of the Lakeshore Demolition wheelchair rugby team, which has five United States Quad Rugby Association (USQRA) National Championships (1998–2003). 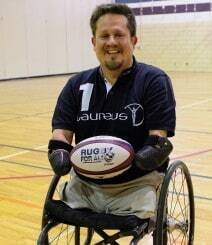 Bob was selected to the US Paralympic Rugby Team, and he won a bronze medal at the 2004 Paralympic Games in Athens. In April 2014, Bob was elected as the President of the USQRA.